Kincharm (g. by Ebony Grosve). 4 wins-1 at 2-from 1200m to 1800m, A$409,430, AJC Ideal Store Hurstville Welter H., STC NRL That's My Team 2YO H., Congratulations Forensics H., 2d BTC Champagne Classic, Gr.3, QTC Grand Prix S., Gr.3, AJC Canonbury S., L, Clarence River JC Grafton Cup, L, AJC Blues Point Hotel H., Souls Private Equity H., City Tatt's RC A New Era H., STC Nepean Engineering H., Myer Ladies Day H., Hyland Race Colours H., 3d NSW Tatt's RC Widden S., L, STC WJ McKell Cup, L, Lemnos 2YO H., AJC Randwick Betting Auditorium H., Jim Beam H., STC Nivea Visage H., Bet a Day.com.au H., WSROC Apprentice P., 4th MRC Sandown Guineas, Gr.2. Queen of Rock (f. by Elvstroem). 5 wins from 1150m to 1600m, Manawatu RC Skellerup H., 3d Cambridge JC William Inglis & Son H.
Ebonetto (f. by Ebony Grosve). 3 wins from 1500m to 2000m, STC Ascot Winter Special H., 2d STC Tooheys New H., 3d AJC Dairy House H., STC Jacob's Creek Sparkling H., Schweppes H.
Penny to Sell (f. by Pentire). 2 wins. See below. Black Fusion (g. by Pentire). 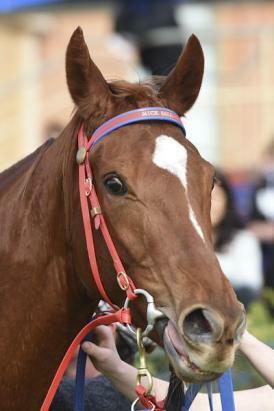 6 wins at 1300m, 1600m, A$99,360, to 2014-15, 2d MRC (Mornington) Wise Choice Fine Foods P.
NARRATION (Bassenthwaite). 3 wins-2 at 2-at 1200m, 1600m, NZ$84,270, A$10,000, ARC Haunui Farm S., L, Ellerslie Punters Club Juvenile H., 2d Manawatu RC Eulogy S., Gr.3, 3d New Zealand Oaks, Gr.1, ARC Ladies Mile, Gr.3, Waikato RC Sir Tristram Fillies Classic, L, 4th AJC Flight S., Gr.1, ARC Royal S., Gr.3. Racing Writer (Racing is Fun). 7 wins from 1200m to 2000m, A$221,390, STC Rydges Welter H., AJC Beau Zam P.H., STC Comrade H., Hibiscus H., 2d GCTC Prime Minister's Cup, Gr.2, AJC Chairman's H., Gr.3, STC NE Manion Cup, Gr.3, 3d AJC Ludwig Leichardt Flying Welter H., Bondi Junction H., STC Banksia H.
Calligraphy (Kaapstad). 4 wins from 1600m to 2950m, Avondale JC Harrison Grierson S., STC Rosie Sun H., 2d STC Stayers' Cup, L, The Welkin H., Epping H., 3d STC Reckless Welter H., Begonia Belle H., BOP RC Young Read Chartered Accountants H.
Beechwood. 9 wins from 1400m to 2000m, NZ$98,300, Manawatu RC John Henderson Ltd H., 2d Manawatu RC Members' H., Real Estate House H., WRC Wainui H., 3d WRC Wadestown H.
UMBER (Umatilla). 5 wins from 1300m to 1750m, A$348,400, VRC Matron S., Gr.3, MRC Summoned S., L, TR Trevaskis H., 2d MVRC Sunline S., Gr.2, MRC Geoffrey Bellmaine S., L, VRC Cadbury Roses Mother's Day P.H., Peter Rowland at Flemington H., MRC Deck the Halls H., Glasshouse Cafe at Caulfield Tabaret H., Maddelina H., MVRC Karibu Graphics Mile H., 3d MRC Geoffrey Bellmaine S., L, Geelong RC Briseis Gold Cup, 4th MRC How Now S., Gr.3, MVRC Tesio S., Gr.3. Producer. Belle Princess. 4 wins to 1500m, A$94,150, VRC Riverside H., 3d VRC Maybe Mahal H., VATC Airmaster P.H., VRC Irish Day at Flemington H., MRC Wenona Girl H. Producer. Elucidate (Silver Dream). 4 wins at 1200m, 1600m, ARC Eden H., WRC Douro Cup, 2d Manawatu RC King & Teppett H., 3d WRC Thompson H., Gr.3. Producer. Katiki Bay (Habitation). 7 wins-1 at 2-to 1400m, CJC Pioneer H., Otago RC Bob Shepherd Memorial H., Black Douglas H., 2d CJC Welcome S., L, Otago RC Dunedin Guineas, L, 3d Otago RC Champagne S., L, 4th Gore Guineas, L.
Beric (Silver Dream). 4 wins-1 at 2-from 1200m to 2200m, WRC Belmont H., 3d Waikato Hurdles, L.
Silver Scribe. 5 wins. See above. Race Record: 15 Starts 2-1-2 A$56,860. 2 wins at 1600m in 2014-15, Ballarat TC Lakeview Hotel H., 3d VRC Rivette Series Final H.